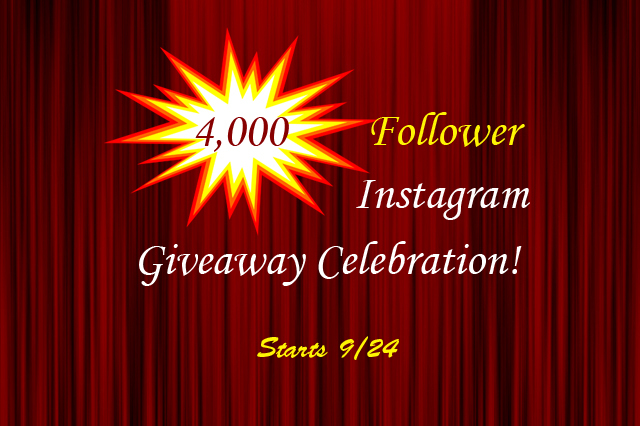 Love, Mrs. Mommy: 4,000 Follower Instagram Giveaway Celebration! 4,000 Follower Instagram Giveaway Celebration! I am super excited to announce that Love, Mrs. Mommy has over 4,000 Followers on Instagram! To celebrate, I am giving my readers WEEKS of awesome giveaways on Instagram! This fun event starts on September 24th and each giveaway will last for 4 days. The total number of participating sponsors will make this spectacularly fun event last over 3 weeks!! To join in on these Instagram Giveaways, here is a link to my page. A big "Thank You!" goes out to all of my awesome readers! Thanks to you we have made it to this exciting milestone! Here's to many more wonderful celebrations! Thanks for following Love, Mrs. Mommy!